Saints in Connecticut. Relics point to Jesus Christ. Litchfield County Times’ reporter Tom Breen published his “Catholic Retreat Near Mystic Features Severed Arm of Medieval Saint” on May 25, 2013. He writes on the first class relic of Saint Edmund of Canterbury, a renowned English archbishop, in a Mystic, CT, retreat house by the same name. The infrastructure of holiness rests, in part, with the witness to the promptings of the Holy Spirit. Saints, for those who are Catholic, are men and women who know they are sinners, who have been forgiven, and who know what it means to live the sacred Scriptures. Specifically, they point to Christ as Messiah and say that it is in fact possible for all of us to be saints. The Church has venerated, not worshiped saints and their relics. As reliable witnesses, the saints to this day point to Jesus. By the second century Christians would pray in the places where the martyrs were buried and/or where they were killed. A human contact is necessary for all of us. The practice of offering Mass upon the tombs of the saints became normal; when the Christian community expanded, the practice of praying with the saints followed. Devotion ensued and Connecticut has a verifiable saint to honor. Saint Edmund of Canterbury’s feast day is November 16. A while ago I mentioned the sainthood study of the 17th century Jesuit Father Matteo Ricci being opened by Diocese of Macerata. The diocesan phase officially closed on May 10th and the findings were sent to the Congregation for Saints at the Holy See. Father Matteo Ricci was born in the Diocese of Macerata in 1552 and died in Bejing on May 11, 1610. Initially, the cause was opened in 1984 but closed shortly thereafter. But in 2010 fresh eyes and reasonable interested were opened. This is a unique event given that a prominent Jesuit cause for sainthood is given to a Jesuit Pope. As Bishop Giuliodori related concerning his visit to the Pope, “I never imagined I’d be able to speak about the cause of Father Matteo Ricci with a Jesuit pope. After the great attention given by Benedict XVI, who never missed an occasion to encourage us to promote the cause, we now have the joy of placing it into the hands of a Jesuit.” It was Pope Benedict’s interest in this cause that is striking. He said, in part, that with Father Ricci we have a “fortunate synthesis of proclaiming the Gospel and of dialogue with the culture of the people who are receiving it, an example of balance between doctrinal clarity and prudent pastoral action. 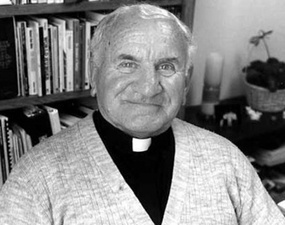 Besides Ricci’s reputed sanctity, he is known for an “innovative method of evangelization based on the inculturation of the faith.” His heroic virtues include humility and courage. Others have derided Ricci for being too cozy with Confucian practices that may be incompatible with Christianity. 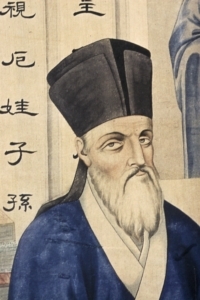 Ricci was a missionary to China to bring the Gospel of Jesus Christ, nothing more. Hence, in Ricci we have a model of evangelization and faith formation that is based on reason: dialogue with the culture, balance, doctrinal clarity and prudent pastoral action. The process of becoming a saint, if you are not a John Paul II or a Mother Terese can take some time. When I heard the news of the completion of US side of Rose Hawthorne’s cause for canonization was made, the other day from a Dominican priest friend, a “praise God” rang out! The last significant ecclesial judgement made on the sanctity of Rose Hawthorne was in 2003 when she was declared to be a Servant of God. The Catholic New York reports the story. Hawthorne is one 10 people with connections in the State of New York who are being considered for sainthood. The events of March we have missed yet another fruit of America’s holiness when the revered founder of Boys Town, Father Edward Flanagan’s cause for canonization was opened in Omaha, NE, and declared a Servant of God. Servant of God Father Edward Flanagan (1886-1948) was a native of County Roscommon, Ireland, on July 13, 1886 he was born the 8th of 11 children of John and Nora Flanagan. In 1904, he came to the United States. Flanagan first studied for the priesthood at Dunwoodie Seminary with the intention of being a priest of the Archdiocese of New York; illness prevented his further studies and he eventually moved with his family to Omaha. There he was accepted as a seminarian and sent to Rome’s Capranica College, with classes at the Gregorian University but finished his studies in Innsbruck’s Royal Imperial Leopold Francis University. Flanagan’s ordination to the priesthood happened on July 26, 1912 and he offered his first Mass in St. Ignatius Church, Innsbruck, Austria. He was a priest for the Diocese of Omaha. Father Flanagan was assigned Saint Patrick’s Church, O’Neill, NE. In March 1913, he was appointed Assistant Pastor to Saint Patrick Catholic Church in Omaha. His natural qualities of generosity to the poor and marginalized and prayer were made manifest. With the permission of Bishop Jeremiah Harty, on December 12, 1917, Father Flanagan opened his first Boys’ Home in a run-down Victorian mansion in downtown Omaha. 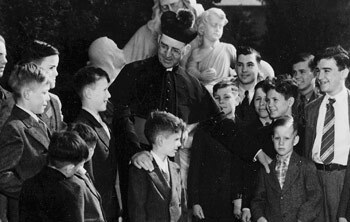 In his lifetime Father Flanagan helped more than 6,000 boys. During a tour of Europe, he fell ill and died of a heart attack in Berlin, Germany, on May 15, 1948. At the request of the Father Flanagan League Society of Devotion (FFLSD), Archbishop George Lucas, of the Archdiocese of Omaha has accepted responsibility for the beatification process. 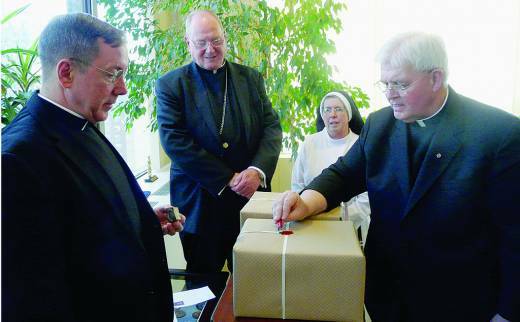 On March 17, 2012, Lucas formally opened the cause of canonization at a service of prayer at Immaculate Conception Church (Boys Town), bestowing the title of “Servant of God” upon Father Flanagan. Dr. Andrei Ambrosi is the Postulator for the cause. More information may be read here. Father Joseph Walijewski (1924-2006), a missionary to Latin America, is now part of a long list of Americans who are being studied by the Church for possible sainthood. Father Walijewski’s cause for beatification opened by Bishop William P. Callahan, bishop of the Diocese of La Crosse, WI, March 19, 2013. Dr. Andrea Ambrosi will be the postulator. Walijewski was born to poor Polish immigrant parents in Grand Rapids, Michigan on March 15, 1924; ordained priest for the Diocese of La Crosse in April 1950; and began missionary work in Bolivia in 1956; he died on April 11, 2006, suffering pneumonia and acute leukemia. Father Joseph also served in Ecuador and Peru. While in Peru, he helped organize breakfast stations that fed 8,000 children per day where he founded in 1987 the Lima orphanage Casa Hogar Juan Pablo II, the House of John Paul II.